Breviloquent is a strategy + design studio. Most of our time is spent working with clients on Web, print, and ID projects, with the precious remainder dedicated to our own explorations. Our favorite experiments apply a fresh perspective—and innovative design—to enhance everyday behaviors, practices, and products. Visit our website to learn more. Before attending Dartmouth College, I graduated from an all-male Catholic high school in central Massachusetts run by the Xaverian Brothers. I was taught by some of the finest men I have ever known there, and I frequently marveled at their example of self-sacrifice and service. It was also there that I received my first formal religious education. The freshmen year curriculum focused on the Catholic Catechism. But, we began to read the New Testament during our Sophomore year. It was then that I first wished to have a book similar to What He Said. Thirty years have passed since Sophomore religion class. I am not a member of a church. But, as we prepared this book, I was frequently reminded of the lessons I learned in High School and the men who lived by them daily. Throughout my life, I have encountered many men and women whose actions are proof to me that Jesus’ message can serve as a timeless solution to peace. Many of them are not Christians, but their behaviors are consistent with the lessons Christ taught. I think this book is for anyone interested in one path to creating a more peaceful world. Before Breviloquent, I spent a number of years designing, building, and marketing digital solutions to real-world challenges. The companies I worked for were pioneers in personalized news, social media, and e-learning, among others. The common thread running through all of them was thinking up entirely new design models to better inform and connect people. I’m happy to say that this thread continues at Breviloquent. Our clients come to us looking for better ways to tell their unique story and reach their target audience. And we look for the same things in our own projects. 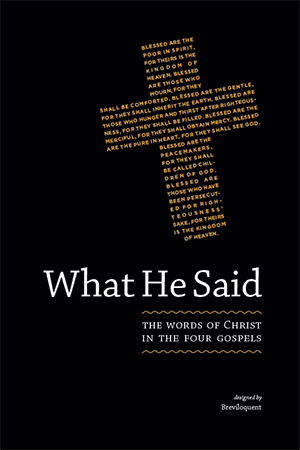 What He Said originated with Peter’s idea to make the teachings of Christ easier to access, digest—and follow. Having always been intimidated by the sheer size and density of the Bible, I thought it was an awesome and worthwhile pursuit and I’ve learned a great deal in our journey to create this book. Having studied Jesus’ words in the Four Gospels, I think He would say that’s a pretty fair summation of His message.